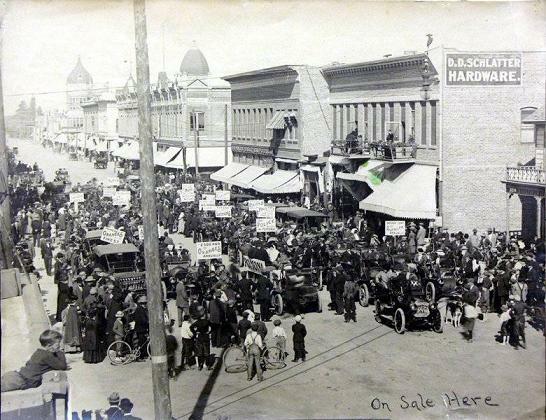 Allan Lagumbay of the Pomona Public Library’s Special Collections department found the above image of East Second Street, undated but from the turn of the century, depicting what seems to be a parade. Check the closeup version at left for a particularly relevant piece of boosterism. While we may now have fleas, at least they’re the highly skilled fleas of Professor Gallivan’s Flea Circus. One wonders why “no fleas” was worthy of a boast. 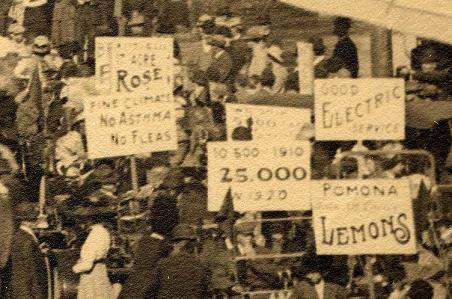 I see the sign proclaiming “10,000 in 1910 – 25,000 in 1920.” Fact or wishful thinking? At least it helps to date the photo. “Good Electric” is the clincher. I’m ready to start packing. How about you? Just be sure your boxes are flea-free. Wouldn’t want to contaminate their flealessness. You hear anything about that? Worrying about fleas in Pomona is a thing of the past — but now we have to worry about the biggest louse in town!